Goddess Lakshmi means Good Luck to Hindus. 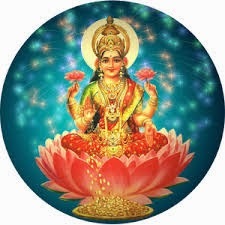 The word 'Lakshmi' is derived from the Sanskrit word "Laksya", meaning 'aim' or 'goal', and she is the goddess of wealth and prosperity, both material and spiritual. 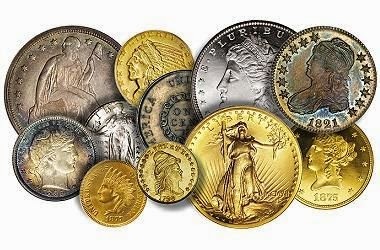 She is dressed in red, with cascades of coins flowing from her hands. She is a Mother Goddess, Mata, & her month of celebration is October. In the mid 90s, a friend told me she saw an association with Lakshmi, & I found a small statuette at the Crystal Wizard. I read about Mata Lakshmi, & gave her a fluorite throne, & surrounded her with rose petals, coins, other symbols of abundance. Here's a traditional Lakshmi meditation. "This is a daily and ongoing process that cannot be ignored. Ignoring your friends is not a good practice, and this relationship with money is no different. Money is a flow and we want that flow to be clear, and open wide. "Go inside in meditation to talk with your Higher Self. Visualize the light flowing through you from above, Breathe, in through the nose and out through the mouth, deeply. "Let yourself feel your whole body becoming light and emptying out so everything is in flow. Give yourself 10 minutes here. Call in your spirit guides and angels, and your higher self. Ask: "what is the lesson behind why I'm having trouble with money flowing in my life?" and listen for the inner knowing to come, however it may come to you. 1) "what is blocking my financial flow?" 2) "what can I do to shift this short-term?" 3) "what can I do to shift this long-term?" 4) "is there anything else I need to know or do about this situation?" -- I often journal about what came up, & an optional way to work with this is write these questions in 'dialogue' format with one of your guides, with Lakshmi, or with 'the Deva of Energy Exchange.' Jot down any action steps, & give yourself a time frame. In a week, review what came up, & any more insights you receive. Months have passed after our lovely First Degree Reiki course & frequent blogging here! 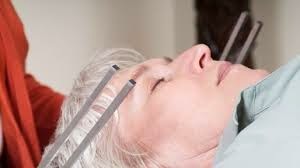 I have several sets of tuning forks, the weight Acutonics 'Planetary tuner' basic set, & Edna Violette Raye Doan's Intention tuners (most of these are not weighted - and intended for off body work. I took the Acutonics practitioner training, & around the same time, found a set of the Intention Tuners on e-bay, from a practitioner who was switching fields! What serendipity. & quotes Lynn McTaggart (The Living Matrix): "Informational medicine that changes disturbed information available in the biofield is going to be the future of medicine." I am grateful for her work, & look forward to exploring her work in the biofield! I intend to order a set of Solfeggio forksm the set Eileen uses most frequently to complement my others.